In the summer of 1852, $36,000 in cash and gold bars lay in a locked safe 165 feet deep on the floor of Lake Erie. Worth $920,000 today, the riches lay within the wreck of the steamship Atlantic. So did more grisly testimony of the shipwreck’s victims, estimated as ranging from 130 to over 250. The deaths represented about a third of the 576 travelers packed onto a steamship meant to accommodate far fewer. The era’s stream of immigrants pouring west made a profitable trade for passenger steamers traveling the Great Lakes. The Atlantic was the fastest one of all, speeding to Detroit from Buffalo in just 16-and-a-half hours. A towering steam engine churned huge paddle wheels on either side of the vessel. 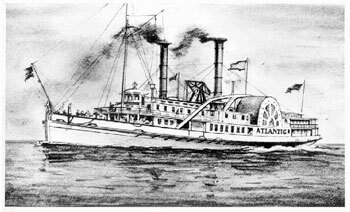 Despite her power and 267-foot-long brawn, the Atlantic succumbed when she was struck on the night of Aug. 20, 1852, by the Ogdensburg, a ship from a rival ferry line. In the chaos and panic that ensued as the Atlantic began sinking, several of the lifeboats swamped when they hit the water. Some passengers grabbed cushions or anything buoyant and jumped in the water. The Ogdensburg circled back and picked up about 250 survivors from the water. Immigrants among the rescued traveled on into the new world with no possessions, and some, according to survivor Amund Eidsmoe, one of the 132 Norwegians on board, went in a half-naked state to Milwaukee. In that city, a collection was taken up for their benefit. Eisdsmoe received $30 and a suit of clothes.